The first-ever Fayette County Farm Bureau “Farm to Fork” event was able to raise $6,150 for the Hospice of Fayette County “Expanding our Heart” fund. The presentation was made at a recent Hospice meeting. From left to right are Steve Berk, Carolyn DeWeese, Brandi Montgomery, Wilma Coulter, Jessica Draganic, David Persinger, Shirley Pettit, Gwynne Gibson, Debbie Weade, Lynda Wilt, Jim Oughterson, Terry Summers and Danny Dodds. The first-ever Fayette County Farm Bureau “Farm to Fork” event was able to raise $6,150 for the Hospice of Fayette County “Expanding our Heart” fund. A check was presented to Hospice of Fayette County board members during a recent meeting. With so much growth occurring with Hospice’s patient care and staff numbers, the organization’s Expanding our Heart program was designed to build an addition to the existing Hospice building on North Oakland Avenue in Washington C.H. The expansion project will provide additional work space for clinical staff to care for Hospice’s daily patient census, recently as high as 57. It will increase work space for 30 employees instead of 20; provide space for patient records that must be kept and securely stored for seven years after the patient’s death or discharge; offer a quiet private room for meetings with patient families and other bereaved; allow for additional storage space for patient care supplies; add a work room; and will revamp the surrounding lot for additional parking. Approximately 150 people were in attendance for the Aug. 20 Farm to Fork event, hosted by Garland Farms, which also prepared all of the locally-grown food. At the inaugural event, Rachel McClish from Rachel’s House assisted with food preparation, the Fayette County Shepherds’ Club donated the lamb, Dan and Jane Huff donated the pork, Jay Fannin donated the beef, produce was provided by Jones Farm Fresh Produce and King Farms, breads were provided by Your Other Mother’s Kitchen and The Martin’s Baked Goods, and homemade ice cream was donated by Ricketts Farms. Sponsors were: Ohio Farm Bureau, Fayette County Farm Bureau, JD Equipment, Bluegrass Farms, Fayette County Farmers’ Market, Fayette County Travel & Tourism, Merchants National Bank, Farm Credit Mid America, Smokin’ Joes, Hospice of Fayette County, and the Miami Trace FFA parked cars, served food, emceed the event and helped clean up. Steve Berk, the organization director for Ohio Farm Bureau in Fayette, Clinton, Greene and Warren counties, tended the bar along with his wife, Jessica Berk. The wine and liquor were Ohio products provided by Valley Vineyards in Morrow, Ohio and Watershed Distillery in Columbus. Following the agenda items, “Cattywampus” provided the evening music during social hour and the meal. The Miami Trace FFA provided guests with a brief history of agriculture in Fayette County. There was also a silent auction, wheat bundle sales and a dessert auction. Between the Fayette Farm to Fork committee’s donation along with the silent auction and wheat bundle sales that Hospice facilitated, the event made almost $8,000. “We are looking forward to planning next year’s event, which will be held at Peterson Farms in August 2017,” said Montgomery. 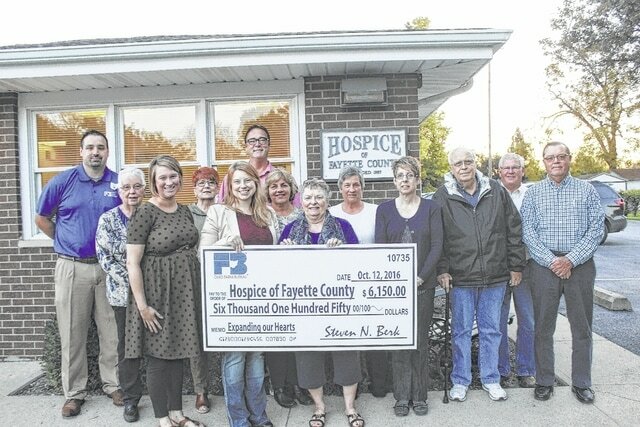 https://www.recordherald.com/wp-content/uploads/sites/27/2016/10/web1_IMG_2517.jpgThe first-ever Fayette County Farm Bureau “Farm to Fork” event was able to raise $6,150 for the Hospice of Fayette County “Expanding our Heart” fund. The presentation was made at a recent Hospice meeting. From left to right are Steve Berk, Carolyn DeWeese, Brandi Montgomery, Wilma Coulter, Jessica Draganic, David Persinger, Shirley Pettit, Gwynne Gibson, Debbie Weade, Lynda Wilt, Jim Oughterson, Terry Summers and Danny Dodds.